If you have a commercial office/warehouse space that requires video coverage of the office, warehouse, production, shipping and parking areas or it is for your home covering the front door, driveway/front yard, back yard/back door and gate/side walkway. Guru Security can design and install a security camera system that will exceed your expectations and match your budget. You have a choice of IP based or HD-Analog based systems that come with camera resolutions from 1080p (2 Mega Pixel) to 4K (8 Mega Pixel). Remote viewing, remote access to all our video surveillance systems is provided by a free APP for your mobile phone, tablet and browser access for your PC. This allows you to see all your cameras in live and playback modes from where ever you are in the world as long as you have an internet connection. We configure your internet router and make sure your mobile phone is set up with the APP working. Selecting and installing security camera systems can be complicated. There are many questions to be answered. Here is but a few. IP or HD-Analog based system? What resolution (Mega Pixel)? What camera form factor? What camera lens? What camera features do I need? WDR? IR? What storage or hard-drive size? Where to place the cameras to get the best view?How to run cables? How to set up the front end for playback audits? is this an upgrade or new installation? How to do all this and remain on budget? 7 ways our Video Surveillance Systems can help you? Deter and record criminal activity. Remote viewing of home or business from smart-phone, tablet or PC allows you to save time and travel expenses. Verify alarms before dispatching the authorities to reduce false alarm charges. Improved situational awareness provided by “eyes “all around your home or business. Automated alarms and analytics, adding analytic smarts can greatly improve your reaction time to events. Employee productivity and training is improved by video surveillance making it a great management tool. Vandal dome cameras come with a Lexan cover and metal housing. Security screws hold the camera together. A special security toll is required to open the camera. Commonly used in commercial and outdoor applications. 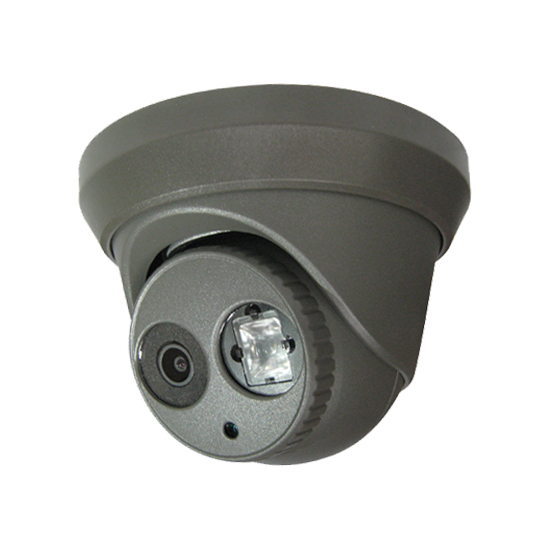 Turret dome cameras come with increased IR illumination for better night time viewing. The camera housing is plastic and comes in white or grey coloured housing. Commonly used in home outdoor and commercial indoor applications. Bullet cameras come with a sun shield and increased IR illumination for better night time viewing. The camera housing is metal. Commonly used in commercial outdoor and warehouse/production plant indoor applications. Pan/tilt/zoom (PTZ) camera allows the view to be moved side to side, up and down, as well as zoom in or out. Control is manual or automatic preset views. Fish Eye cameras provide very wide angle 180 degree view. Covert cameras are hidden or disguised as something else. Commonly used indoor where a camera is not needed as a deterrent. Motion sensor camera looks like an alarm system PIR or motion sensor. Camera has IR illumination for night time viewing and a swivel to aim for best view. Pinhole camera is installed in an object, clock, picture frame ceiling tile, wall etc. to conceal the camera. LET GURU SECURITY VIDEO SURVEILLANCE EXPERTS, DESIGN A SYSTEM FOR YOU!